Hey guys, wine is not just for the ladies! 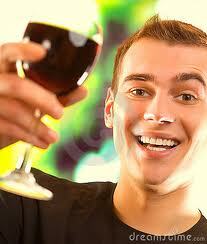 Men may want to guzzle up more reds and whites after hearing this news: Drinking wine makes sperm stronger. According to a new study, the average modern man has some sperm problems, what with the heavy caffeine intake, tight-fitting boxer briefs (bummer), and being stressed out ALL THE TIME like the rest of us. Has your man had a cellphone for more than 10 years? His sperm are probably weaker because of that as well. Great. But never fear, because wine is here! In the study, Polish researchers found that drinking two glasses of wine for three days every week may help men’s little swimmers do more laps — so don’t go chugging it all right at once. Making a baby? Well, light some candles and pop open a bottle or two before you do the deed. Show your lady that romantic side, and you might get lucky. Not making a baby? You have my permission to drink wine anyway.